Wishing Phil a speedy recovery! This morning’s ride was planned by Phil L – “brisk” of course! Phillip G stepped into the leader’s rôle. We all took time at the start to pose for Phil – and especially in the wave to wish him a speedy recovery! All the best, Phil! We pose – looking ready for a “brisk” ride! I did a recce of the route of Stage 1 of The 2014 Women’s Tour on Wednesday. It went well. I know all the turns! If you’ve booked a place in the LandRover/trailer combination, please be at the Canoe Centre at 7.45 a.m. so that we can be loaded and away at 8.00 a.m. Iain D will drive us to Oundle. So if you’re making your own way to Oundle, Plan A would be to park behind the Joan Strong Centre (PE8 4BZ). Plan B is the Co-op Car Park, St Osyth’s Lane (PE8 4BG). I believe the St Osyth’s Lane car park has a public toilet that is open from 7.00 a.m. on Sundays. I think, therefore, that we will meet up in the Plan A car park ready to roll round to the Market Square for 9.30 a.m. I’ll try and keep in touch by mobile if I think the LandRover/Trailer is going to be late. My mobile number is 07960 302095. At 9.30 a.m. we’ll have a photo in the Market Square and make a start. 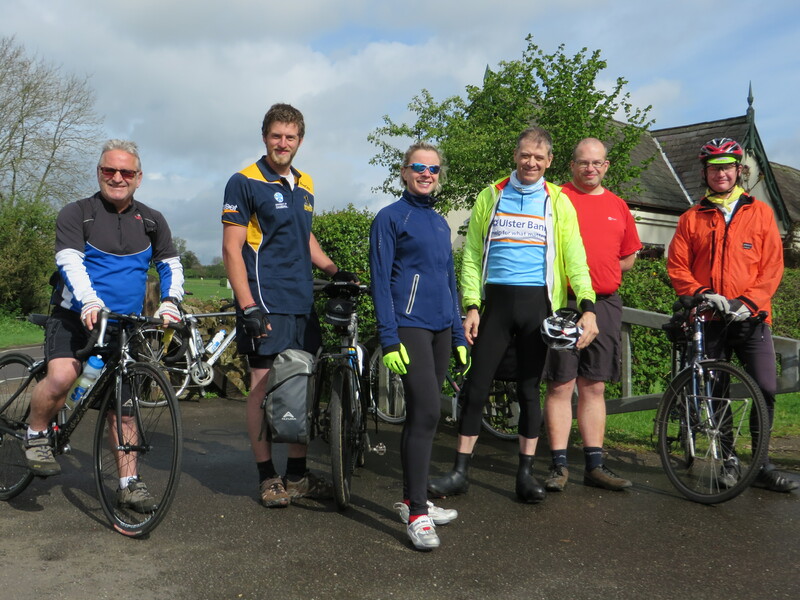 There are eleven of us travelling from Northampton and there could be up to fifteen Oundle cyclists joining us. For our ride, we won’t be going through the two private estates – Broughton and Althorp – but on quiet roads around the perimeters. The first really busy part, shortly after the Broughton estate, is to cross the A6003. I meandered a bit here on the recce but I think it best to stick to the race route: from Geddington past the hamlet of Newton and coming out onto the new roundabout on the A6003, turning right for 200m on the dual carriageway, then left onto the quiet road to Rushton. The second busy road would be the A508 from Lamport to Brixworth. We shall avoid this by taking the Scaldwell Road out of Lamport and entering Brixworth on the Holcot Road. The next busy roads would be the A5199 from Spratton to Chapel Brampton, soon followed by the A428 past the entrance to Althorp that the race will use. We’ll avoid these stretches (and anyway we can’t pedal through Althorp) by going from Spratton via East Haddon to pick up the race route again at Great Brington. The road was closed on my ride at Little Brington for renewing the water mains – more of a problem for the race than for us, as we can squeeze through one at a time. I popped into Nortoft (the county council’s organisers for race day) at Nobottle and it’s their biggest worry. After Nobottle, the route is busy-ish down Sandy Lane to the roundabout where we’ll go across the A4500. Then it’s fairly quiet again to the southern edge of the southern development where cars can speed along Wooldale Road towards Caroline Chisholm School. Then it’s quiet again through Great Houghton to the A428 Bedford Road into town. I stuck to the main road here but it’s easy to ride on the shared-use pavement pretty much all the way from Great Houghton to Becket’s Park if you prefer. Then from Becket’s Park it’s 300 metres up Derngate to the Guildhall. I think we’ll have another photo here at 4.00 p.m. The route is here on RideWithGPS. I started after 10 a.m. and then had a p*nct*r* at Rushton so I was out-of-kilter for café stops. Geddington would be too early anyway. The Dovecot at Newton doesn’t open until noon on Sundays. At Rushton I changed inner tubes on a picnic table outside The Thornhill Arms. By the time I’d done that it was noon, the pub opened and I had coffee and a sandwich. But noon is the opening time on Sundays too and we’ll be through Rushton by then. An ideal cafe in Desborough doesn’t open on Sundays. And the Tollemache Arms in Harrington opens at noon on Sundays for roast dinners only. The George in Brixworth at 31 miles (out of 58) may be the best bet for a lunch stop but I’ll give it some more thought. One advantage is that riders who don’t fancy a full day could join us at lunchtime in Brixworth for the afternoon. And as we go around Northampton there are many points where one can leave the ride and go straight into town. If I were to finalise the plan as having lunch at The George, then you might want to bring something to eat for a roadside elevenses at about 20 miles. At the end of the ride, I’ll be pedalling to Kingsthorpe with Iain D and Emily. I’ll then drive the three of us to Oundle to pick up the LandRover/trailer and Emily’s car. There could be two more spaces in my car for this drive. (Just … it’s only a small car!) Speak to me before the day if you would like a lift. Again, any questions? I’m on 01604 843894 and 07960 302095. Any suggestions or improvements? Don’t wait until we’re about to start the ride! Speak to me during the week! This is a “brisk” cycle ride to Canons Ashby. The aim is to maintain 14-15 mph average with as few stops as possible. A shorter alternative route will be available for those who want a slower pace. The route, which includes several hills, is roughly Brampton Valley Way – Althorp – Little Brington – Flore – Weedon – Everdon Stubbs – Sustrans Route 70 (south) to Canons Ashby (teastop). Then return by Banbury Lane – Pattishall – Kislingbury. Distance 35 miles, return by 1.00 pm. This should be a varied, enjoyable but slightly demanding route with a nice teastop at 20 miles. Current weather forecast for Saturday is unsettled with a risk of showers, possibly heavy, 10 – 12 degrees with moderate breeze from the SSE. So nothing the right clothing won’t deal with! Road bikes are advised. 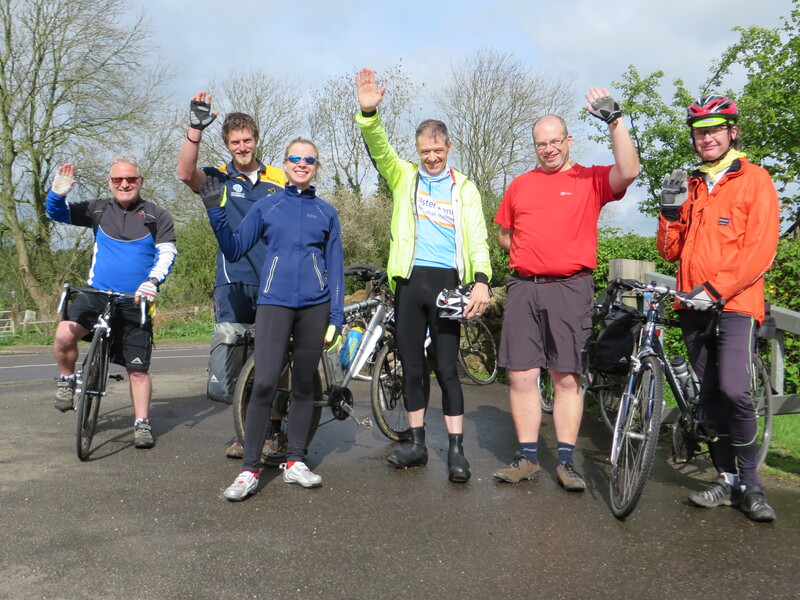 Meet Brampton Valley Way (BVW) / Welford Road Crossing (NN6 8AA) for a 9.30 a.m. start. The BVW car park is on Brampton Lane opposite The Windhover. With the planned route involving redways and their bollards, and this being the first anniversary of our ride to Monschau (blog readers can remind themselves of that day’s events here), I was a little apprehensive at the start, especially given the fog that had settled over Northamptonshire. We were joined by a few of the regular crew, one occasional member and a new rider who also teaches spin classes! And I’d got such a gentle ride planned. The seven of us took the usual route out from East Hunsbury towards Towcester, cut across the A5 south of town to Whittlebury and then had a pleasant and trouble-free run into Potterspury where we arrived for elevenses, at eleven o’clock, just as the shop was opening for the day. Refreshed, and with the GPS now running (! ), we headed off to Deanshanger and the lanes west of Milton Keynes before turning towards the conurbation itself. With thanks to Google Streetview, we found our desired redway fairly painlessly. This was important as that particular redway should, in theory, have delivered us all the way across MK directly onto the Willen Lake promenade. Alternating between wooded/grassy areas and some of the less salubrious housing estates, it actually made good on its promise and we arrived, unscathed, at Willen Lake not 50 yards from lunch. This pleased Milton immensely. It being a sunny Bank Holiday Monday, there was a bit of a wait for food but since we’d bagged ourselves a table out in the sun we weren’t too fussed. It seemed better to wait than to ride back in towards the town centre. Navigating away from lunch was harder, but we headed north on the redways then west across Great Linford to pick up the Millennium Cycleway then the Grand Union canal north out of town. That lane is now more cratered than ever, and just north of the bridge it’s a little muddy, but still usable. I hear it flooded a bit over the winter which doesn’t surprise me. The group split in Quinton, those from the east side of town opting to avoid the town centre, leaving the rest of us to make our way back to East Hunsbury and the end of a very pleasant day’s riding. The route for the (last 2/3rds of) the day is here. I forgot to turn the GPS on at the start (oops) and, interestingly, it failed to pause itself at Willen Lake. That does seem to be a recurrent issue there. Maybe MK messes up GPS somehow? Easter Eggs! Burn them off on the Easter Monday Bank Holiday ride. We’ll be rolling through the wooded lanes south of Whittlebury, stopping for elevenses at Wakefield Farm in Potterspury and heading out to the west of Milton Keynes before testing the ride leader’s navigation skills on the MK Redways as we try to find Willen Lake and lunch. If we’re successful, we’ll then leave Milton Keynes by way of Mill Road and Hanslope before passing through Salcey Forest on our way back into Northampton. All up, it should total about 55 not-too-strenuous miles. We have a leisurely ride planned, leaving from the Brampton Valley Way (BVW) / Welford Road crossing at 2.00 p.m. (Postcode NN6 8AA; parking at BVW car park up Brampton Lane opposite The Windhover.) We will cross the dam at Pitsford, tackle part of the BVW and the Gamboro Plantation track to Cottesbrooke. 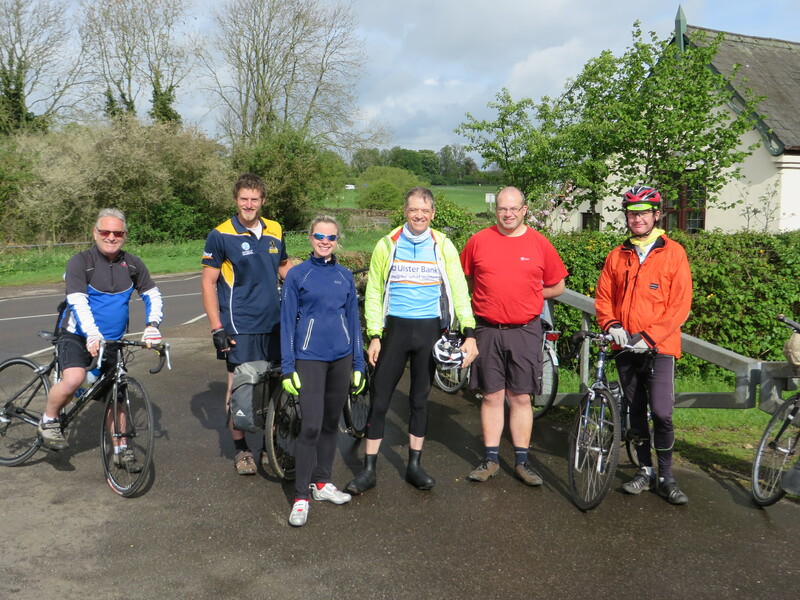 Then we head back through Creaton and Holdenby to Church Brampton for coffee; then it’s back down the hill to where we started. Only one significant climb but please note that one of the tracks is unsurfaced so we might all be walking that one (short) rough stretch! Weather forecast is currently dry so I hope to see you down at the Brampton Valley Way at 2.00 p.m. on Saturday. Iain is on 07909 992468. Next Tuesday is a social evening! The cinema is off the Billing Brook Road at NN3 8JR. May I suggest we meet in the foyer at 7.15 p.m.? If coming by bike, folding bikes can be kept in their office; for full-size bikes there is a locked cage at the rear. If you want to use the cage, please let me know by Monday and I will visit the cinema again to make sure we have access. The running time is 2 hrs 04 mins. Afterwards, we could enjoy a drink at “The Bold Dragoon” in Weston Favell Village (48 High Street, NN3 3JW) where bikes can be left at the rear. It’s the nearest pub with good ales (e.g. Timothy Taylor’s) to the cinema. Any questions? Want to let me know you’re coming? I’m on 07960 302095!